Jonathan Hickman has been working on a massive story that could be the end of the Marvel 616 Universe. 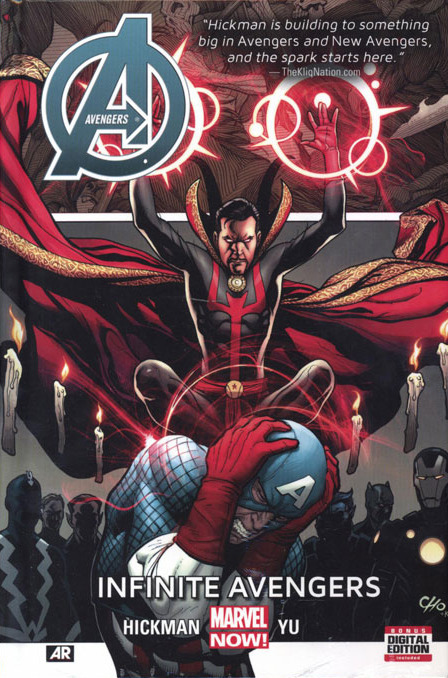 In Hickman’s Avengers: Infinite Avengers the story begins to gain momentum as some beyond the Illuminati realize that the Earth incursions are occurring. And in true Civil War style heroes will choose sides! Captain America is having some pretty disturbing dreams. He dreams about a threat to Earth and the Universe, a destroyed world and betrayal. Cap, realizing dreams are reality, grabs Black Widow and Hawkeye to confront the traitor Tony Stark. In the midst of Avenger-on-Avenger fighty fighty the Time Gem appears and sends Captain America and a team of Avengers into the future. The team jumps 50, 400, 5,000, and 51,000 years into the future giving the team a glimpse of what is to come including the state of the Avengers. The story finishes in Fractured Temporal Space where Rogers alone is given advice about his future choices. Along the way, Cap has to process the new information he gathers and ask if he should stand against Tony Stark and the Illuminati in the destruction of other Earths. Agents Daniel and Ben both enjoy “What If” stories, and this fits in that category. Now I will call it “What If” because there is no Battleworld which is what we know will be. And we get some interesting Avengers’ combinations. 50 years from now, Hawkeye is still alive and kicking. He is just older and maybe more grumpy! And the Avengers Union he is a part of includes familiar faces like an aged Hyperion and a new Starbrand and Black Widow. Oh, and Hawkeye really hates Tony Stark. 422 years from now the Avengers are patterned after today’s team and are an instrument of Ultron’s rule, though some would like to survive into the future post-Ultron. 5,045 years from now only the Future Man stands, well that and his familiar friend. And 51,028 years from today an Avengers’ based artificial intelligence survives. Finally out of time, familiar faces urge Captain America to return to his time dedicated to a suggested action. Rogers takes in all he learns at each stop to balance the reality of saving his Earth with his moral compass. The cool thing about this story is in every generation there are Avengers. Even out of time we find Avengers. The history of the super-team is truly endless! It should not shock us that Hickman works in a reference to Avengers Forever since this tale reinforces the fact that the team continues n until the end of time. And for those who like the Busiek story, they will find delight who seeing who is waiting out of time. With Agent Carter we have been discussing morals a lot lately. And this story is ripe for the same sorts of conversation. If you break down Tony Stark’s actions, he is part of the most productive group of mass murderers of all time. He has or will kill entire populated Earths to save both our Earth and his universe and the universe of the other Earth. It has become a numbers game for Stark and the Illuminati. They will destroy a world to save countless one. This decision was not an easy one for them to come to, and over titles show us they are not united in their action. When you realize the Earth’s just keep coming it begins to feel like an endless chore. But for Captain America, the soldier, taking the life of one world to save all is unacceptable. I do not know if I actually lived in the world and had Namor’s chair on the Illuminati if I could take the same stand as Cap. It feels like a no win situation and you can understand, in a simplistic way, how Stark got to where he is. But my heart is with Rogers and the hope that he can find another way to save all the Earths while proving mass destruction is unacceptable. Captain America vs. Iron Man, yes it is Marvel’s Civil War! Wait sorry it’s Avengers: Infinite Avengers! Seriously though when you break it down, do these two fight so much because they are so close and passionate. Or is it because they really are the Odd Couple? I can pretty much guarantee more Avenger on Avenger fighty fighty is coming as we get ready for Secret Wars.